The landscapes of violence have become too familiar, too close to home. Despite decades of scientific research, we are only beginning to understand the roots of violence that connect child maltreatment, spouse and partner abuse, and aggression in our neighborhoods and communities. Cruelty to animals is often part of these landscapes of violence-at times, a strong link to destructive interpersonal relationships. Research on this link has recently received increased attention. However, the layperson, student, and professional interested in this link often face the daunting task of locating the critical references in this area of inquiry. 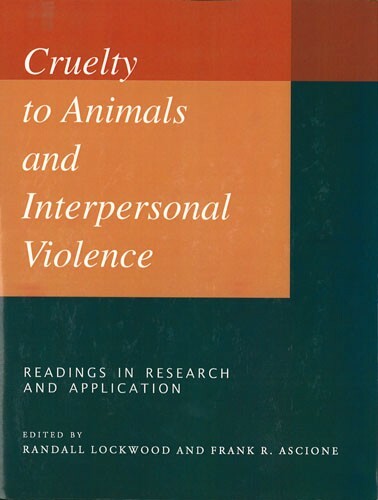 Cruelty to Animals and Interpersonal Violence presents in one volume historical, philosophical, and research sources that explore the maltreatment of animals and the ways people hurt each other. Diverse disciplines are represented among the readings, including psychology and psychiatry, criminology, social work, veterinary science, and anthropology. A bibliography of related books and articles is provided for readers who wish to pursue this topic in greater detail. Randall Lockwood has been the senior vice president for the American Society for the Prevention of Cruelty to Animals (ASPCA) since 2005. He was previously at the Humane Society of the United States (HSUS), where he served in several positions, including vice president for research and educational outreach. He has testified in dozens of trials involving cruelty to animals and has published several books and a number of articles. Frank Ascione is a Professor of Psychology and adjunct Professor of Family, Consumer, and Human Development at Utah State University. Ascione received the 2001 Distinguished Scholar Award from the International Association of Human-Animal Interaction and the International Society for Anthrozoology, and in 2002, was selected as USU's College of Education Scholar/Researcher of the Year. Ascione serves on the Child and Animal Abuse Prevention Advisory Council of the Latham Foundation. During his career, he has published several books including Cruelty to Animals and Interpersonal Violence: Readings in Research and Application (1998), Child Abuse, Domestic Violence, and Animal Abuse: Linking the Circles of Compassion for Prevention and Intervention (1998), both by Purdue University Press, and authored Safe Havens for Pets: Guidelines for Programs Sheltering Pets for Women Who Are Battered.